Swiss mould maker Georg Kaufmann, together with partners, has developed the LIPA (Lightweight Integrated Process Application) technology for the mass production of lightweight composite parts. 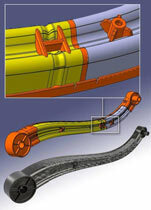 The result is a lightweight part of extremely high strength and stiffness. The entire production process will be demonstrated at K2013 on the Arburg exhibition stand (A13 in Hall 13) on a hydraulic Allrounder 820 S equipped with servo hydraulics. The machine and mould will be producing a demonstration part similar, for example, to a swing arm for a bicycle or a structural element in a car seat.